« Become a Part of the Team at Eagles Gab Today! No Brian Westbrook or Donovan McNabb – no worries. Getting big contributions from their key backups, the Eagles pounded the Kansas City Chiefs 34-14 in Vick’s return to the NFL on Sunday. 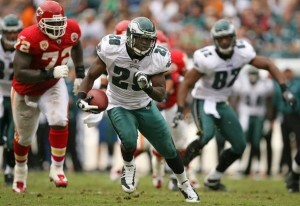 The Eagles didn’t need much from new decoy Mike Vick, who played in his regular season game as an Eagle. Kolb became the first quarterback to throw for 300 yards in his first two career starts. While he did most of the work, Vick got all the attention. Vick will have more chances to display the skills that earned him the Superman nickname back when he was a three-time Pro Bowl quarterback with the Falcons. For now, he’s content doing whatever it takes to help the Eagles win. McNabb missed his second straight game with a broken rib. Westbrook sat out with a sore ankle. It was no problem against the Chiefs (0-3). Kolb, a third-year pro, and McCoy, a rookie second-round pick, filled in nicely. Overall, Vick got in for 11 plays. He lined up at receiver once, took the snap in shotgun formation nine times and was directly under center once. Kolb was on the sideline for the 10 plays Vick was in at QB. With Vick on the field, the Eagles gained a net total of 30 yards. They got 390 without him. Or McNabb. Or Westbrook. “We wanted to gradually get him in and get him back to game speed and knock some rust off,” Eagles coach Andy Reid said of Vick. Kolb threw for 391 yards, two TDs and three interceptions in a 48-22 loss to New Orleans last week. Kolb completed 24 of 34 passes and had a QB rating of 120.6 against the Chiefs.